Today we celebrate the day called “Palm Sunday,” the day of Jesus’ triumphal entry into Jerusalem one week prior to his crucifixion and death. In case some of you are wondering why this is called “Palm Sunday”, it’s because according to the Gospel of John the crowds in Jerusalem came out to greet Jesus carrying palm branches, which they either waved or strewed in his path. Now, of course, as Christians we believe in the inspiration of the New Testament by God and so we know, wholly apart from historical evidence, that these accounts were not made up. But, still, it’s nice to know that even when you consider the Gospels as just ordinary historical documents, they pass the tests of reliability which secular historians use. This can strengthen our confidence in their truth and give us a way of commending their truth to our non-Christian friends who have not yet come to believe in the inspiration of the Bible. Now in the case of Jesus’ triumphal entry, this event is related in one of our earliest sources, the Gospel of Mark, and independently in John’s Gospel. Moreover, although the accounts of this event found in the Gospels of Matthew and Luke are to a good degree dependent on Mark, nevertheless many scholars think that Matthew and Luke also had other, independent sources besides Mark. So the historical case for Jesus’ triumphal entry into Jerusalem is pretty solid. Although Mark and John’s accounts differ in various circumstantial details, they fully agree on the core of the story: that at the beginning of the final week of his life Jesus of Nazareth rode into Jerusalem seated on a donkey and was hailed by the crowds who had come to Jerusalem to celebrate the annual Passover feast with shouts of “Hosanna! Blessed is he who comes in the name of the Lord!,” as they anticipated the coming of the kingdom of God. Now before we look at this passage in detail, let’s set the scene geographically and chronologically. It is the spring of the year, the time of the great Passover feast in Jerusalem, during the Jewish month of Nisan, which is in early April on our calendar. Passover always began on the 14th of Nisan, which that year fell on Friday. So scholars using astronomical data have determined that the date of the Passover feast during which Jesus was crucified was either April 3, AD 33 or else April 7, AD 30. Now Jesus and his disciples are on their way up to Jerusalem for the Passover feast, like thousands of other pilgrims coming to the feast. They have just passed through the ancient town of Jericho, where, according to Mark 10, Jesus healed the blind man Bartimaeus on the way out of town. Jericho is located about 17 miles east of Jerusalem. The Roman road ascends from Jericho over the Mount of Olives, which with an elevation of about 2600 feet stands directly opposite the Jewish Temple in Jerusalem across the Kidron Valley (Fig. 1). 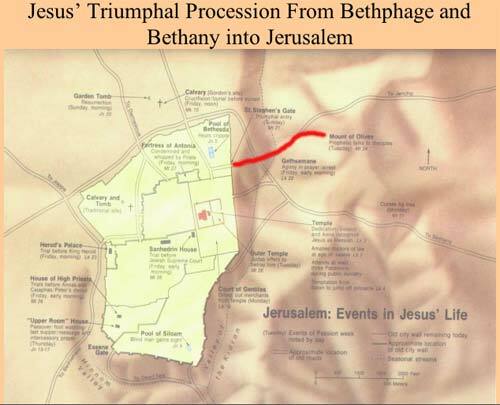 Pilgrims from Galilee in the north, where Jesus was from, typically followed this road to Jerusalem and would pass the villages of Bethany and Bethphage, mentioned by Mark in v. 1. Bethany lies on the south slope of the Mount of Olives, somewhat off the Roman Road, while Bethphage was probably located on the western slope of the Mount of Olives, just across the Kidron Valley from Jerusalem; it was virtually an extension of Jerusalem itself. Reading Mark’s account, one might wonder why Mark mentions Bethany, since Jesus would not actually pass through it on the way to Jerusalem. One might speculate that it is the unnamed village referred to in v. 2, where the disciples are to go find the colt. But that would make Jesus’ triumphal procession almost two miles long, which might seem a rather long distance for people to strew with branches and garments, as they did. So it might seem odd that Mark would mention Bethany. Reading the Gospel of John, however, we discover an interesting fact: Jesus and the disciples actually spent the night in Bethany on their way to Jerusalem, for Bethany was the home of Mary and Martha, whose brother Lazarus Jesus raised from the dead. John reports, “Six days before the Passover Jesus came to Bethany, where Lazarus was, whom Jesus had raised from the dead. So they gave a dinner for him there” (John 12.1-2a). Having set out from Jericho that morning, Jesus must have arrived in Bethany in the late afternoon and enjoyed supper with his friends. It was during this supper that Mary anointed the feet of Jesus and wiped them with her hair. Interestingly, Mark also knows of this incident at Bethany, but he tells about it in another context in chapter 14. It’s interesting that in chapter 11, verses 11, 19 Mark says that Jesus did not spend nights in Jerusalem during the final week of his life, but would go back out to Bethany each evening. Thus, the triumphal entry did not occur on the same day that Jesus set out from Jericho; John says that Jesus spent one or perhaps two days in Bethany and that crowds, learning of his arrival, were already coming out to Bethany to see him. On John’s account, then, Jesus died at the time of the Passover sacrifices, prior to the Passover meal. The problem here is that according to Mark and the other Gospels, Jesus ate the Passover with his disciples in the upper room the night before his crucifixion. In Mark 14.12 we read, “On the first day of Unleavened Bread, when they sacrifice the Passover lamb, his disciples said to him, ‘Where will you have us go and prepare for you to eat the Passover?’.” And Jesus gives instructions to prepare the Passover in the upper room. Now John agrees that Jesus did share a Last Supper with his disciples on Thursday night in the upper room prior to his betrayal and arrest. But how could this have been a Passover meal, if the lambs weren’t slaughtered in the Temple until 3:00 the next afternoon, as John says? Various solutions have been offered to this puzzle. One of the most plausible is that due to competing calendars that were in use in first century Palestine, the sacrifices may have been made on more than one day. You see, the Pharisees and people from Galilee reckoned days as beginning at sunrise and ending at the following sunrise. But Sadducees and people from Judea reckoned days as beginning at sunset and ending with the next sunset. In our modern age, we adopt what I think is the rather weird convention that the day begins in the middle of the night at midnight and goes until the next midnight. Well, this difference in reckoning days completely throws off the dating of certain events, as you can see on the following chart (Fig. 2). According to the Galilean reckoning, the 14th of Nisan begins about 6:00 a.m. on the day we call Thursday. But for the Judean, 14 Nisan doesn’t begin until 12 hours later, about 6:00 p.m. on our Thursday. So when the Galilean, following Jewish regulations, slays the Passover lamb on the afternoon of 14 Nisan, what day does he do it on? Thursday. But when the Judean offers his lamb in sacrifice on the afternoon of the 14th of Nisan, what day is that? Friday! When night falls, he then feasts on the lamb, by his reckoning, on 15 Nisan. Thus, in order to meet the demands of both Galilean-Pharisaical sensibilities and of Judean-Sadduccean sensibilities, the Temple priesthood would have to have made Passover sacrifices on both Thursday and Friday. Jesus, as a Galilean and knowing of his impending arrest, chose to celebrate the Passover Thursday night, whereas the chief priests and scribes responsible for Jesus’ arrest went by the Judean calendar, as John says. Although we have no evidence that Passover sacrifices were made on both days, such a solution is very plausible. The population of Jerusalem swelled to around 125,000 people during the Passover festival. It would be logistically impossible for the Temple priesthood to sacrifice enough lambs for that many people between 3:00 o’clock and 6:00 o’clock on one afternoon. They must have sacrificed on more than one day, which makes it entirely possible for Jesus and his disciples to celebrate the Passover Thursday night prior to his arrest. Having set the scene, let’s look more closely at Mark’s account. The first part of the story deals with Jesus’ obtaining a colt on which to ride into the city. Since Jesus and his disciples would be returning to the Roman road from Bethany, the village where the colt is tied is probably Bethphage. Jesus sends two of his disciples on ahead to bring the colt to him so that he may ride down the descent of the Mount of Olives, across the Kidron Valley, and in through the so-called Golden Gate in the eastern wall into the Temple court. Mark doesn’t tell us what kind of colt it is, but we know that there were three kinds of equine animals in use in Palestine: horses, donkeys, and mules, which are hybrids of a mare with a male donkey. The other Gospels tell us that Jesus chose a donkey. Donkeys are strong pack animals that were widely used as beasts of burden. As we’ll see, Jesus’ choice of a donkey is deliberate and significant. In Mark’s story Jesus displays an uncanny foreknowledge of highly particular events which the disciples will experience in connection with getting the colt. And the simple explanation they are to give, “The Lord has need of it” shows Jesus’ sense of sovereign mastery. Somebody might think that Jesus had simply made prior arrangements with the colt’s owners without telling the disciples. But this seems to miss the lesson that Mark is trying to teach here, namely, Jesus’ foreknowledge and control over the events leading up to his suffering and death. Mark wants us to see that Jesus in not the hapless victim of events which are spinning out of control; rather he remains the sovereign master of his fate as he chooses to go to the cross. In I Samuel 10.7 it says that the fulfillment of these predictions given by Samuel were signs to Saul that God was with him. In a similar way Jesus’ predictions and instructions are signs to his disciples and to us of Jesus’ sovereign control over his fate. To treat these predictions as merely natural arrangements like someone’s planning for a trip is to miss the theological lessons that Mark wants us to learn. “Behold, we are going up to Jerusalem, and the Son of Man will be delivered over to the chief priests and the scribes, and they will condemn him to death and deliver him over to the Gentiles. And they will mock him and spit on him and flog him and kill him. And after three days he will rise” (Mark 10.33-34). In fact, it is something of an understatement to say that these events did not catch Jesus by surprise. On the contrary, he provoked them, as we see in the second part of Mark’s story. With his triumphal entry into Jerusalem Jesus deliberately set the ball rolling that would by the end of the week crush him under its weight. In order to appreciate what happens next, you need to understand something of the Jewish feelings toward Rome. In 63 BC Roman legions under Pompey had put an end to an independent Jewish state, conquering Jerusalem and deposing the King. Although Israel had returned from its exile in Babylon hundreds of years earlier, the golden age predicted by the prophets had not yet materialized. Instead Israel labored under the oppressive military dictatorship of a pagan nation. The Jews chafed under the yoke of Roman rule. Within 35 years after Jesus’ death, Jews would be in full-scale rebellion against Rome, finally resulting in the catastrophic destruction of Jerusalem in AD 70. In the meantime, Israel was a cauldron of unrest. Jews yearned for a messianic deliverer who would once and for all restore to Israel the throne of David and establish God’s Kingdom in the land. The Old Testament prophets spoke of the coming of such a Davidic king, and Jews longed for the fulfillment of their prophecies. During his ministry, Jesus had shunned the public pronouncement that he was the promised Messiah. New Testament scholars have long discussed the so-called “Messianic secret” theme running through Mark’s Gospel. In Mark Jesus never claims publicly to be the Messiah, and when people do recognize him as such, as in Peter’s great confession in Mark 8.29 “Thou art the Christ” or “You are the Messiah,” Jesus strictly charges them to tell no one about him. But now in Mark 11, with this triumphal entry into Jerusalem, everything changes. Jesus was steeped in the Old Testament, as we know from his discussions with the Jewish scribes. He knew and understood the prophecies of Israel’s coming king who would restore the throne of David. In particular he had absorbed the prophecies of the book of Zechariah. Zechariah had spoken of a shepherd appointed by God over His people, and in the 13th chapter he says that the shepherd will be struck and the sheep scattered. Jesus in Mark 14.27 applies this prophecy to himself in telling the disciples that they will all desert him. He says, “You will all fall away, for it is written, (quoting Zechariah 13) ‘I will strike the shepherd, and the sheep will be scattered’”: Jesus is applying to himself Zechariah’s prophecies. his rule shall be from sea to sea, and from the River to the ends of the earth. Jesus is deliberately and provocatively claiming to be the promised king of Israel who will re-establish the throne of David. His action is like a living parable, acted out to disclose his true identity. The Messianic secret is now open news. The triumphal entry shows us Jesus’ messianic self-consciousness and who he took himself to be. He identified himself with the Shepherd-King predicted by Zechariah. Talk about an anti-climax! Jesus doesn’t cleanse the Temple; he doesn’t lead the mob against the Roman fortress; he doesn’t even give a stirring speech. He just looks around and leaves! That may explain why Jesus wasn’t arrested on the spot. His triumphal entry into the city was not something the Romans were expecting or would have understood, and Jesus’ procession probably just melted into the Passover crowd once they got to Jerusalem. But what a disappointment for those who had hailed his entry! What kind of a Messiah was this? What sort of a deliverer is this? In the ensuing days, Jesus did cleanse the Temple, but he didn’t raise a finger against the Romans. In fact he didn’t even raise his voice against them. Instead he said, “Render to Caesar the things that are Caesar’s” (Mark 12.17). Who needs a king like this? By Friday, enough of the multitude were sufficiently disenchanted with Jesus that the Temple priesthood who had engineered his arrest and delivered him to the Romans on the treasonous charge of claiming to be “King of the Jews” were able to turn them against him. And now they chanted, not cries of “Hosanna!” but “Crucify him! Crucify him!” And so to the cross he went, to die as he knew he must. What lessons can we learn from the story of Jesus’ triumphal entry? Let me mention two. First, we see the Lordship of Jesus. The crucifixion of Jesus was not an accident that befell him unawares while visiting Jerusalem. Rather Jesus understood and embraced his calling to undergo so excruciating a death. In fact he deliberately provoked the events that would lead to his execution. He understood himself to be the Shepherd-King prophesied by Zechariah and openly assumed this role in his provocative triumphal entry into Jerusalem. Thoughout the process he displayed his foreknowledge of the events of his passion: the finding of the donkey, the arrangements for his Last Passover Supper in the upper room, Judas’ betrayal, Peter’s three-fold denial, the disciples’ deserting him, his deliverance to the Gentiles, his scourging, humiliation, and execution. He announced all these things in advance. He thereby showed himself to be Lord over history. There is a theology today that is making inroads into the Christian church called “the Openness of God.” It claims that God does not and cannot foreknow the free acts of human beings and therefore can only guess at the future. He is said to be a God who takes risks, who gambles, and who sometimes loses. The passion predictions such as the ones we’ve seen today show that Openness of God theology is wrong. Jesus knew, and knew in sufficient detail that it couldn’t have been guessed, exactly what was to happen to him that week in Jerusalem. Openness of God theology therefore inevitably depreciates the person of Christ. In the story of the triumphal entry we see disclosed Jesus’ sense of lordship as he directs events toward their foreseen ends. The second lesson is related to the first: Jesus doesn’t always meet our expectations. The Jews were expecting a king who would be a great military leader like David, who would throw off the yoke of Rome, and establish God’s kingdom by force. When we read some of the Old Testament prophecies, we can understand why they had such expectations; they weren’t at all unreasonable. But Jesus was radically different than their expectations. When he rode into Jerusalem, he did not do so on a horse, the symbol of warfare and the choice of conquerors, as Pompey had done. He did not even pick a mule, the steed of Jewish kings like David himself. Rather, he chose a donkey, a pack animal, a lowly beast of burden, as his royal mount. As Zechariah had prophesied, he came humbly and bringing peace. The Kingdom of God which he preached and inaugurated was not an earthly, political kingdom, but the rule of God in the hearts of people who know and serve Him. But this was not the kingdom which the people expected or wanted, and so they rejected Jesus as their Lord. In our Christian lives, as we grow older, we all encounter situations in which God does not fulfill our expectations. Perhaps He doesn’t bring a marriage partner into your life. Or maybe you find that your marriage hasn’t lived up to your expectations. Or maybe you’ve been passed over for a promotion or a position you really deserved. Or maybe illness or tragedy has struck your life in an unexpected way. And the temptation is all these situations is to bail out of what the Christian faith teaches and to do things your own way. You marry that non-Christian who’s in love with you. You file for divorce. You grow resentful and bitter over missed opportunities. You give up confidence in Gods’ love for you and no longer trust Him. As I’ve grown older as a Christian, I’ve seen these sorts of things happen again and again in the lives of Christian friends. When God doesn’t live up to our expectations, then we jettison God and do things the way we think they should be done or resent Him for not giving us what we want. And what I want to say here is what the first lesson taught us: Jesus is Lord. He’s under no obligation to live up to your expectations. If He chooses to give you a life of suffering and hardship, of disappointment and failure, he is Lord. So many of us seem to think that if Christ doesn’t fit our expectations, then we’ll just reject Him, as the crowds in Jerusalem did. But Christ is Lord, and he doesn’t have to fit our expectations of Him. Christ never promised his followers a happy life. The disciple is not above his master, and the Master has chosen the road to Golgotha. If you are called to tread that same path, that is the Master’s prerogative. What I’m saying is that we must tailor our expectations to what God decrees, not try to tailor God to fit our expectations. Christ is Lord, and He knows what is best. If we try to make him fit our expectations, what is acceptable to us, or else we will reject him, then that is the path to self-destruction. We must not be like the people in Jerusalem, who hailed Christ as their king, just so long as he fit their image of what a king should be. Let us rather acknowledge him truly as our King, our Lord, our Sovereign, and receive from his hand whatever he decrees.